There is so much I could tell you about my amazing influencer friend Jax, and her incredible blog - I can highly recommend the peanut butter banana bread, in fact, all the recipes I’ve tried are delicious, which I why I was so behind her brand and her story when she said she wanted to rebrand and asked me to do a shoot with her. We spent a few days at her farm in the Winterberg mountains shooting all sorts - from family photos, to food photography, to profile photos, all as content for her blog, Instagram account and Facebook. Those squishy hamster cheeks, the little wrinkly toes, the open mouth and perfect tiny lips, and the joy and pride on big brother’s face as he cuddles his new little sister on her first day home. These are the things that disappear so fast and I love to capture for families so that they can cherish them forever. Is there anything as special as visiting a dear friend and meeting her sweet little baby boy? I pulled out my camera while we popped in for a visit with Sarah and Matthew and snapped a few shots because they had no photos of their little family of three yet. I was lucky enough to photograph their incredibly beautiful wedding in 2017 (if you have a moment, go and browse through the magical photos) and so loved getting some beautiful moments with little Beren. 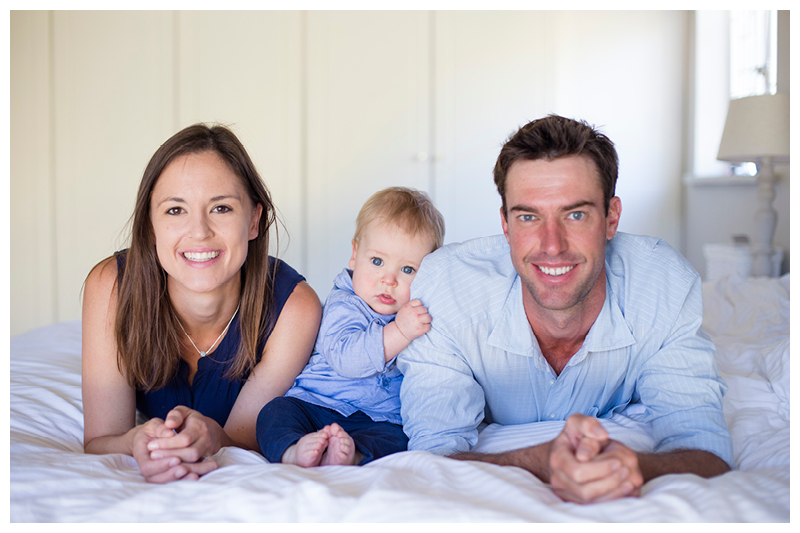 A beautiful morning capturing the perfectly ordinary, the perfectly perfect with a special family, Mariette, Derik and cute little Josh in their home. This is one of the most beautiful family shoots I have ever done - one of my favourite families (who I have been photographing since Christoff was one), and Jeffery Bay, the most lovely venue. Gwen has wanted a beach family shoot for a long time and I’m so glad we made it happen. I loved popping into visit the Websters last weekend and just capture a little slice of their lives with their new baby girl. A newborn shoot does not have to be a long drawn out process with lots of posing, I love to just capture a little slice of normal life, in your home, on your bed, so that you can remember those precious moments that go by so fast. Lizelle was one of my first friends in the funny little town of Alexandria where I live and I loved capturing these maternity photos of her and her family, although put a little boy in a wide open space, with some sheep to chase, and it isn’t going to be easy to pin him down for photos. But we had fun and got some lovely family photos and pregnancy photos in the process. I've known Cath and John for years, we were pregnant together, attended prenatal class together and have I have loved seeing Tom grow into such a confident, smart little boy. When he was 6 months old I did a family shoot for the Walters, and so I was thrilled to do another shoot with them when Tom was 18 months. What a beautiful family! I love it when life comes round in a full circle - I know Steph from when I lectured photography - but that feels like another lifetime ago. Now we are both mothers, and I had the joy of meeting and photographing her sweet family. I loved spending a Sunday morning with Steph, Warren and Ava and capturing a little glimpse of their lives together. Tucked away in a little back street in Bedford, these beautiful friends and their simple small town life were wonderful to photograph, but have also been the most special friends over the last few years I have been back in the Eastern Cape. Their home is bright, happy and welcoming, and their garden is an inspiration - green lawns, fruit trees and delicious veggies. It was such fun spending the afternoon doing life with them and capturing a little bit of what their days look like before little boetjie arrives. It's amazing how much can change in a year. Just over a year ago I was out at the Lombard's farm on Christoff's first birthday taking family photos and documenting his lovely first birthday party. It was also the day that we starting telling people that we were pregnant. A year has gone by and we now have our own little munchkin, and Christoff has doubled in size and energy levels! I spent the morning at the farm yesterday running after this bundle of energy as he smelt the flowers, mowed the lawn, played with his tractors, pushed his wheelbarrow and ran circles around us. Here are a few of my favourites. Gorgeous parents, doting grandparents, a stunning farm, and a beautifully renovated farm house - little Jordan really has landed with his bum in the butter. When I first met Gina, this boy was still a bump in her tummy and we were comparing preggie notes. Time has flown by and Jordan is such a big boy - I had such fun with him and his family capturing a little bit of their life on the farm. What a fun Sunday afternoon spent on the farm with the beautiful Painter family picking veggies, braaiing, toasting marshmallows, rolling on the floor, swinging and herding sheep. This is my favourite type of shoot - documentary of real life moments. With parents as good looking as this, let's be honest, Tom didn't stand much of a chance of not being a total cutie! This special boy was born just a week or two before my little girl and it was so much fun spending the afternoon with him and his parents. He was such a good sport and full of smiles despite the long grass and pumping wind. Saturday was a beautiful sunny Eastern Cape day - perfect for hanging out with the Bain family and snapping some shots of them. The boys' grandparents were visiting for the long weekend and joined us too. Despite singing, dancing and serious bribes, there weren't too many smiles from the boys but their parents made up for it with their serious modelling skills. What a fun afternoon, and looking forward to seeing this lovely family again soon. Welcome to the world baby Alex, what a pleasure to have met you. I met Alex when he was a rather large bump in his mom’s tummy. Tara, John, Blake and I navigated the Grahamstown aloe fields for a gorgeous sunset family preggie shoot. A few weeks later and here he is in the big, wide, rather chilly world, one day old, a whopping 4 kgs and just perfect! It was so special to meet this little boy and I look forward to capturing more happy family moments soon. What a fun afternoon spending time with Tara, John and Blake on a beautiful winter's afternoon just outside of Grahamstown. This family of three (and soon to be four) were easygoing and fun, and Tara was a trooper climbing over fences and negotiating spiky aloes with a very preggie belly. Look out for baby photos soon when Midgley #4 arrives! It's been more than two years since I have seen these special friends and since then they have travelled across the world, between South Africa, Scotland and South Korea, and added to their numbers with the most precious Caleb Bear. Vix and Brennan are staying on her mom's beautiful farm near Tarkastad and so we took a scenic drive through the mountains to visit them and snap a few family photos. It was such a treat to stay on the beautiful farm and spend time with this special family!